Malta administration announced an earlier implementation of Fall Prevention Devices FPD onboard existing Maltese register ships not later than 1 January 2013. According with MSC 317(89), MSC320(89), MSC Circ.1392 and MSC Circ.1327 existing vessel fitted with life boats having on-load release should retrofit according with new requirements by the first scheduled dry docking after 1 July 2014 and in any case not later than 1 July 2019. Malta administration brought the above date earlier to 1 January 2013. The above requirement is applicable to life boats having on-load release. Conventional life boats with release when boat is waterborne do not need to be retrofitted. 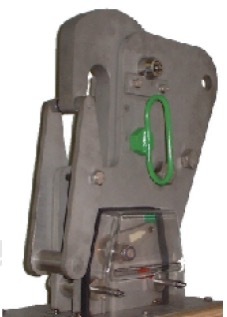 It is recommended to contact you life boat manufacturer or the on-load release hook manufacturer to determine if your equipment complies with above requirement or for a proposed modification. It is advisable to request the approval documents by the administration of the proposed modification by manufacturers or certificates of new hooks. How to identify if the hook is on-load or off-load. Usually the on-load hooks have a centralized release within the life boat. Also some of the hooks have imprinted the word “On-Load”. They might also have the maximum operational load. If no marking on the hook then see the drawings of the boat /hook. This information should be stated there. For your easy reference, below a picture of a typical on-load release hook with safety pin. Finally, centralized release lever might has a safety pin that will prevent a non intuitional release or a safety pin is placed on the hook. If this is the case check with manufacturer, it might comply with the above requirement. Below a green safety pin to prevent accidental release.